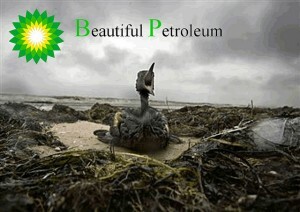 Nothing much on BP these days, so the Gulf of Mexico oil spill must be pretty much taken care of, right? The length of shoreline where oil is present has increased from 287 miles in early July to 320 today. In Bay Jimmy, La., alone, 32,000 gallons of oil were sucked up in a recent 10-day period. Oil, not surprisingly, is clinging tenaciously to marsh grass. Cooler fall and winter weather will thicken the oil and make it harder to extract. Cleanup worker count has dropped by nearly two-thirds, from 47,000 at the height of the spill to 16,200. 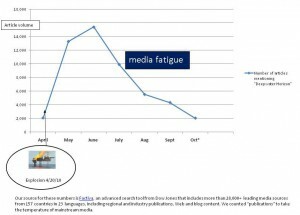 The disaster hasn’t gone away, but where’s the media? Well, kudos to USA Today for the above info, and to Frontline for kicking BP’s tail on Tuesday night. But in general, the media follows the conflict, the drama and the fancies of its paying audience to those insipid places we yearn to go. As a result, we’ve moved on from Afghanistan. We’ve moved on from Haiti. And we’ve moved on from the Gulf of Mexico. To document this catastrophe fatigue, we searched for news stories on “Deepwater Horizon” (the name of the exploded rig and shorthand for the entire debacle) from April 2010 through Wednesday, Oct. 27 at 10:30 EST. Here’s what we found. As you can see, the media bombards us with stories from April through July. Then the fatigue sets in. 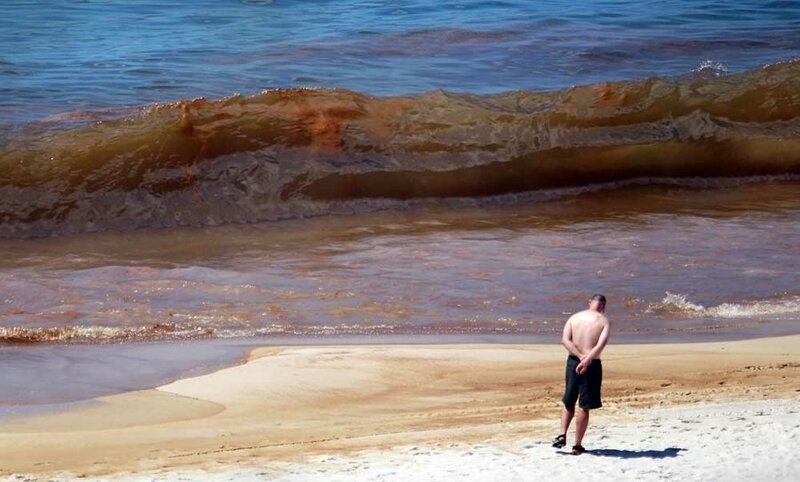 Just six months after the worst oil spill in history, the media is practically silent. But the problems remain. That’s why Sean Penn is still in Haiti. That’s why Billy Nungesser is still in Plaquemines Parish. 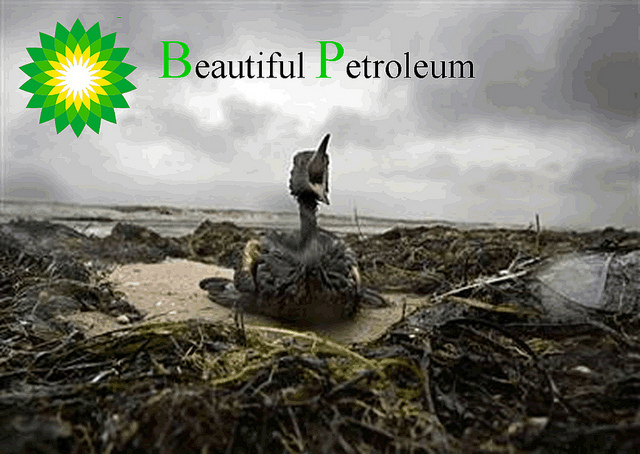 That’s why BP workers are still cleaning up the oil – some of them, at least. Meanwhile, the media, drawn by our own insatiable appetite for trifling entertainment, has moved on to … well, Brett Favre’s … ankle. Can Google save the planet? Yes, yes it can, if it can do for a malfunctioning ecosystem a fraction of what it’s done for information. 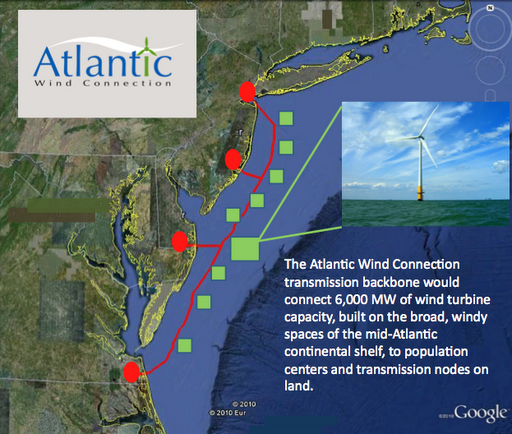 The search giant just invested in an ambitious wind energy backbone for the eastern seaboard. Atlantic Wind Connection aims to collect 6,000 megawatts of offshore wind – enough to serve nearly 2 million households –and deliver it to transmission nodes from New Jersey to Virginia. This project would act as a “superhighway for clean energy,” eliminating the need for every wind farm to string its own lines to shore. This is Google’s second major investment in wind, following investments in solar and geothermal. Keeping its own house in order, Google has pledged to become carbon neutral. As part of that initiative, it has built energy-efficient data centers, installed solar installations at its offices, and purchased carbon offsets for emissions it can’t prevent. On the demand side, the company has created the Google PowerMeter to help consumers reduce their energy use. Oh, and for what it’s worth, the company uses 200 goats to mow an overgrown field at its Mountain View, Calif., headquarters. The goats are clever, but what’s really important about Google is its uncanny ability to execute. Google wasn’t the first search engine, but it was the first to actually find what you were looking for. That prompted the world to rebrand the generic verb search (look it up). Google is the company that put a chink in the armor of the Microsoft Office juggernaut with Google Docs. This is the company that lets you fly to anyplace on their planet (Google Earth) without a plane ticket (you might want to lower your window shades). Then there’s that kooky little site that plays videos. What’s next? Google Earth Engine will analyze satellite imagery to monitor changes in forest coverage and other environmental bellwethers. Then there are the cars that drive themselves, and the TV that’s also the Internet. Can Google save the planet? CleanSpeak Google is good. (Google is maybe too good sometimes, at things like managing personal data their servers pick up along the way.) Given Google’s feats, it was heartening to see Google’s wind investment news last week, especially after a withering review in the Boston Globe of the nation’s first offshore wind farm, Cape Wind, which is threatening to come in at $2.5 billion, or 2.5 times the original price estimate. Plenty of other wind projects are also facing strong opposition over cost, use of open land, wildlife impacts, noise and esthetics. Google is not perfect. Other companies rank higher on greenest company lists, but do you see Dell saving the world? Is HP putting the Dead Sea Scrolls online? I don’t really know if Google can save the world. I do know the planet isn’t out of the woods yet, and harvesting wind energy on a continental scale would sure be a nice start. And now a message from the “Signs of Hope for Renewable Energy” Department concerning that hotbed of renewable energy development – Ireland? That’s right. A cloudy little island with no vast prairies or sun-drenched deserts recently announced that it generates 15 percent of its electricity from renewable sources, mainly wind and solar. To expand its renewable energy production, Ireland is now going hammer-and-tongs at the promising but under-unexplored area of wave power. 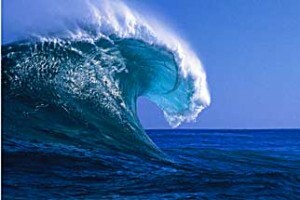 Last week, Sustainable Energy Agency Ireland (SEAI), the country’s renewable energy agency, announced a major wave power development deal with the Australian company Carnegie Wave Energy to develop Ireland’s Belmullet wave energy area. SEAI estimates there is enough energy in the waves that wash against Ireland’s west coast to meet 75 percent of the country’s energy needs. Harnessing it is another matter, of course, with a lot of unanswered questions and untested technologies to evaluate. Nevertheless, the country is plowing ahead to help reach a goal of 40 percent renewable power by 2020. Seeing as the United States has two thousand-mile coastlines, Ireland’s move into wave power should be of more than passing interest. There are pockets of interest in wave power in the U.S., most notably in Oregon, where the first U.S. wave power facility started construction in February of this year. The news coverage of the project, however, struck a skeptical note about the project’s potential, pointing out that a wave facility in Portugal went under for financial reasons, that a pilot wave power facility sank off the Oregon coast in 2008, and that the wave plant’s electricity will be five to six times more expensive than conventionally generated electricity. Okay, so those projects bought the farm and the economics haven’t caught up to the technology. So what? Whatever happened to Yankee ingenuity? I’m old enough to remember watching the first Moon landing on television. It came after a lot of embarrassing and occasionally deadly mistakes, including the 1967 Apollo 1 launch pad explosion that killed three astronauts. Two years later, Neil Armstrong made history by jumping out of the Lunar Module. Is figuring out wave energy that much harder – if at all? Not according to Ireland, and in my humble opinion the Irish have built up some cred in this area. Solar energy is a significant portion of Ireland’s renewable energy capacity. Solar means sun. How often do you think of Ireland and sun in the same breath? The place makes Seattle look like Santa Fe, it’s so cloudy. If the Irish can turn the same trick with waves that they did with the sun, they’ll reach their goal of 40 percent renewable energy by 2020 in a walk. Where will the resource-rich U.S., currently with 7 percent of its power generated renewably, be in the renewables race by then? The tissues next to the sink in the men’s room at work taunt me every time I stand at the slow-working hand dryer waiting for my hands to stop dripping. It only takes about 15-20 seconds under the dryer until I can go back to work, but drying my hands on tissues is even faster – maybe three seconds. Nevertheless, I resist the siren call of processed wood pulp. When I use the hand dryer, I’m not throwing anything out. Since the climate change debate started, I’ve been obsessed with throwing away as little as possible in favor of the “reduce, reuse, recycle” mantra. So I stand there with my hands under the dryer even though the paper product would be more convenient. Convenience: a perfect segue from hand drying to junk food bags. 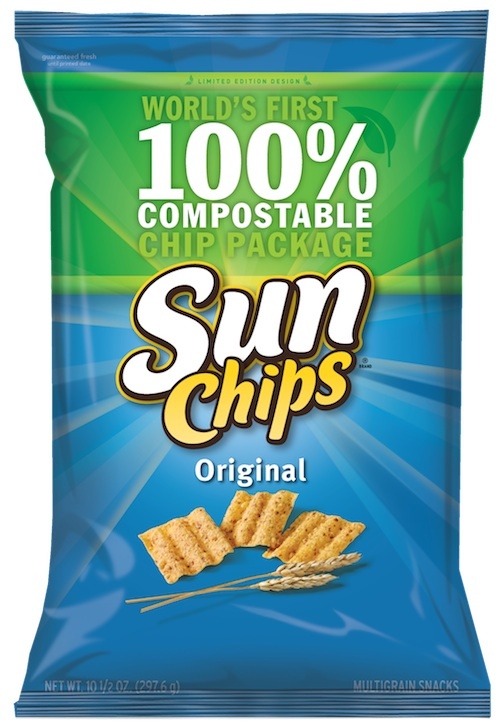 Frito Lay, maker of those quasi-healthy crunchy snacks called SunChips, recently embraced the “recycle” part of the 3R mantra by packaging SunChips in a compostable bag. That’s quite a leap up the sustainability index from the plastic bags that most snack food comes in. Most plastic never degrades completely, even in direct sunlight, because there’s nothing in plastic for microorganisms to eat . The compostable bags, by contrast, can be gone in a couple of weeks because they’re made of plant matter that microorganisms like just fine. Considering the amount of snack food Americans eat, Frito Lay’s biodegradable SunChips bag was definitely a step in the right direction. It was a step right back when Frito Lay announced this week that it’s discontinuing the compostable bag because customers think it’s – waaaaaaaiiiiit for it – too loud. Apparently, the compostable bag’s molecular structure makes it snap, crackle and pop lustily every time a chip junkie sticks his/her paw into a handful of no-trans-fat flavor. Facebook groups like “I wanted SunChips but my roommate was sleeping…” and “Nothing is louder than a SunChips bag” cropped up in protest. 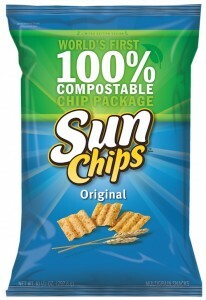 Customers complained to Frito Lay, which decided to replace the compostable bags with plastic on all SunChip flavors except the original. First of all, what kind of wusses have Americans become when the crinkling of a food bag turns us catatonic? How loud can one bag of chips be? Are people bleeding out of their ears because they had to go for that one extra handful of SunChips with lunch? No matter. A vocal slice of the populace don’t want their late-night munchie attacks broadcast over the SunChip BagNet, so 30 million plastic bags are heading back into the waste stream. This is the wrong message for corporations to send the public. As a society, Americans need to throw away less. What we do throw away should be as biodegradable as possible. Packaging is a major contributor to pollution and landfill clutter. Frito Lay’s initial effort to make a mainstream consumer product more environmentally sustainable was the right message to the general public. Snuffing it wasn’t. Here’s a radical solution for all of the people who think the SunChip bag is too loud. If you don’t want anyone to know you’re having a private moment with the SunChips bag – waaaaaaaaaaaaiiiit for it – take it OUTSIDE before you open it. You’ll get some fresh air with your healthy SunChips and maybe burn a few of them off as you walk from the couch to the porch for a fix. Ask Frito Lay to bring back the biodegradable bag. It might not be the convenient solution, but it’s the right one. Now if you’ll pardon me, I have to hit the men’s room with my new fast but environmentally sustainable hand-drying solution: the backs of my pant legs. Successful marketing draws attention to itself, sometimes drawing a bull’s eye on its own back. Case in point is Abercrombie & Fitch, which critics claim has been dousing its products, employees and storefronts with a signature cologne that, it turns out, includes a potentially dangerous chemical. Diethyl phthalate has been linked to sperm damage in adult men and abnormal development of reproductive organs in baby boys. So, how bad is Abercrombie’s “Fierce” for men? It’s well below the median in a list of popular fragrances containing secret chemicals (not listed on product labels), according to a report by the Environmental Working Group in May. And the chemical in question is already present in 97 percent of Americans. That tells us the critical factor in making Abercrombie a big, juicy target is apparently the carpet-bomb scent campaign. Allergy sufferers and chemical-sensitive individuals are built-in sympathizers, as well as parents concerned about Abercrombie’s sexualized advertising. Abercrombie is clearly the perfect foil for the Teens, a media-savvy organization with an enviable list of sponsors spreading its outrage Facebook, flickr, YouTube, posters, petitions and more. They’ve got everything but their own fragrance.